The Merriam-Webster Dictionary defines an athlete as “a person who is trained in or proficient in sports, games or exercises that require physical skill and strength.” Athletes stick with their goals and are passionate about the sport that the are doing. Amanda Scarborough is my favorite athlete. 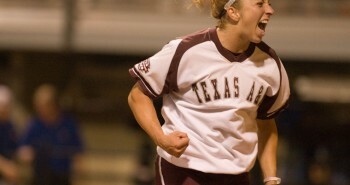 Amanda Scarborough was a softball pitcher for Texas A&M. Throughout her softball career, Amanda faced many challenges and never gave up. Her passion for the sport of softball has led her to coaching young girls and inspiring them to work hard and dream big. Amanda teaches lessons that will help young girls of all ages to become a better softball player, but also gives tips on how to succeed in life. Amanda Scarborough was born on May 10, 1986 to her parents, Mark and Sally Scarborough, in Houston, Texas. Getting involved in softball all started when Amanda turned 5. Amanda knew right away that she loved the game and worked really hard both at lessons and at practice to become better. 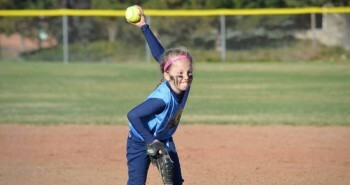 Softball did not necessarily come easy to her, like it may to some. Amanda quickly learned that she was going to be someone who would have to put in the hours to practice if she wanted to have success at the sport. “Amanda was always ready to play and practice. No moaning, no frowning…she inspired others to be better. There is no better definition of a leader,” Amanda’s high school coach stated. 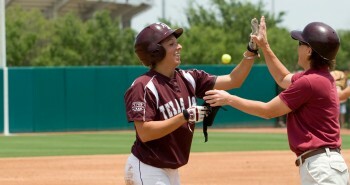 Through her hard work and dedication of the sport, Amanda lived her dream of playing for Texas A&M. During her time at Texas A&M, she earned many honors including, 2005 Big 12 Freshman of the Year and Player of the Year, 2007 Big 12 Pitcher of the Year, and was 2-Time First Team All American (2005 & 2007). Amanda continues to be passionate about the sport of softball through giving private pitching lessons, doing all skills clinic, and commentating on live college softball. Although Amanda was successful and was able to live her dream, her road was not always easy. At one time, Amanda had to face the fact that another parent went up to her mother and told her that she would never make it as a pitcher and Amanda should probably just stop. Another time, while playing 1st base during practice she was hit on the right side of her head by a line drive, causing her brain to bleed. She had to take time off and if she wanted to go back in the game Amanda had to wear a helmet on the mound while pitching. She did whatever it would take in order for her to get back on the mound, even if it meant wearing a helmet and pitching at the same time. At first it was very embarrassing, but she badly wanted to be out on the field playing. Amanda eventually in her senior year had to quit because of an injury to her foot. She needed surgery, but this didn’t stop her from being a part of the team. She still helped out with her teammates by watching batters and helping her catcher call pitches for the pitcher. Even though she had some really tough times this didn’t mean that she gave up. Amanda found other ways to still be passionate about her life dream of softball. 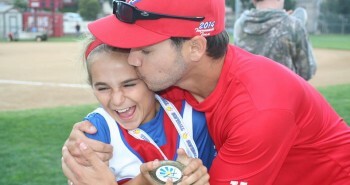 Amanda’s passion for softball is contagious. Today she is running clinics and teaching private lessons to help girls of all ages get better at softball. She writes a blog that is always being updated with new ideas and different drills for girls to use to develop the right mechanics. Amanda has also become part of a new group with three other post-college players. They call themselves, “The Package Deal”. At their clinic they teach young girls the skills they need to be good ball players. How to catch, field, throw, and hit the ball. Most importantly, they show how their passion for the sport can impact lives on and off the field. They give life lessons that girls can use to become confident, strong adults. They believe in each and every girl who walks through the door and inspires them to write their own story, to follow their dreams. 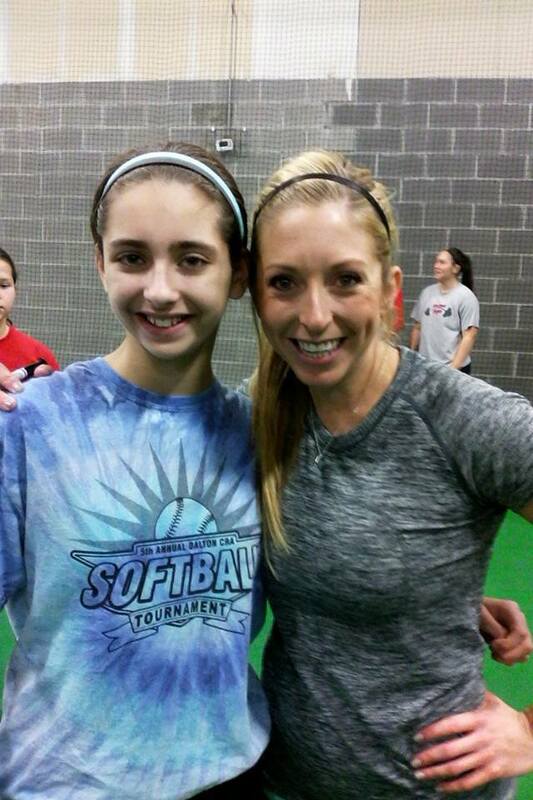 I recently attended one of Amanda’s pitching clinics. It was an incredible experience. I learned different techniques about pitching and skills to make myself a better athlete. Amanda’s speeches were very inspiring and motivational. I left feeling unstoppable. Like I could go as far as I could dream. I hope to someday go as far as Amanda and play softball in college. Next postWhat’s Wrong With Being a Beginner? Hi Amanda I googled motivational quotes for softball girls and your page came up after reading your story I was motivated and excited but I had to realize it’s my daughters team who need some motivating word from some like you. My daughter plays on a 12U team here in Merced California she love playing but I see and hear so much negativity among the team and coaches, I talk to my daughter everyday about being positive but when the team is together it negative attitude. As a parent how can I help the team? I’ve wanting to ask the coaches if I could just talk to girls before the game just to see if I could shine some positive work to them but coaches not happy about that…. What would you suggest I do or say.